The FolderSync (FS) pane is an embedded pane in the Portfolio window which may be toggled on/off from view and displayed in different locations around the Portfolio window. On first install, the FolderSync pane is by default 'on' (visible) though it will contain nothing until you add some watched folders. If you use FS you should definitely read pages 69-77 of the v7 manual; it describes issues like creating/deleting OS folders, moving originals files via FS, etc. Note that FS, when cataloguing, reflects the settings in Advanced Cataloging Options but it does not use any of the Cataloging Options settings. This means you can't add Keywords (other than path/filename), Descriptions and other field data, copy/move images or rename files as part of FS. Rather you the concept is you use FS to create the record and then use the same tools as in Cataloguing Options to do renaming, keywording etc. In the Windows client, the FS pane can be floated as a palette or docked at left (default) or right of the main application window. In Windows the FS pane can also be docked 'stacked' above or below the gallery pane; drag the splitter bar(s) to determine how height or width of each pane. On Mac the logic is more complex (and less intuitive! ); the folder pane is a drawer that may be displayed to the left or right of the main application/gallery window (at left is the default unless the left margin to the screen edge is too small). The pane is only ever shown from the first (Mac) gallery window opened; if you open other galleries in their own window (non-default behaviour) they will have no FS - or gallery - pane and won't show one, despite the View menu settings. If you close the first Portfolio window (with the FS pane) and have other gallery windows open the only way to reinstate the 'main' window and see the FS pane - without closing/re-opening the catalogue - is to double-click the quickfind box on the toolbar; this will always return the built-in "Find Results" gallery and thus re-instate the window with the FS and gallery panes. 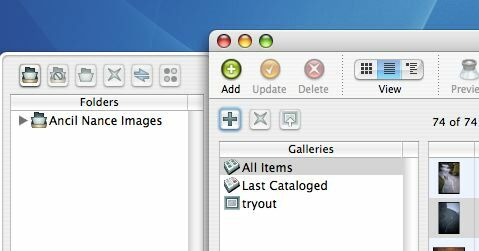 One last Mac client quirk; if the folder pane is currently not visible and the main window is maximised (green button), displaying the folder pane has no apparent effect as it opens hidden off screen - click the green button again to un-maximise and you'll see the pane. Unlike Windows, the FS pane can't be floated or docked 'stacked' above or below the gallery pane; nor may the FS pane width be altered - it is fixed width. Clicking a folder (Watched or otherwise) will show all records for the contents of the folder in focus and its sub folders. Option/Ctrl+click the folder to show only that folder's contents. This is a reverse of the v6 behaviour. Create Subfolder on Disk (Windows = New Subfolder). 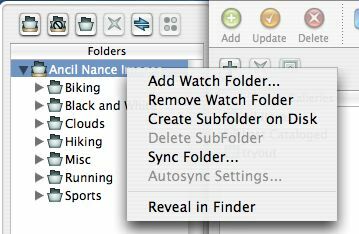 This creates a new OS subfolder to the folder currently in focus in the FS pane. A new folder icon appears and the name defaults to 'Untitled'; the name is selected and in Edit mode so you can enter the correct name. Delete Subfolder (Windows = Delete Folder on Disk). This deletes the folder, sub-folders (if any) and all content. You are given a Yes/No confirmation dialog. A 'Yes' also deletes all records for these items - regardless of the Preference setting for "Delete Items for Missing Source Files". Sync Folder... (Windows = Synchronize Folder). This starts an FS synchronisation action. The Preference settings dictate whether of not an FS dialog is seen or the synch proceeds automatically. FS reflects the settings in Advanced Cataloging Options but it does not use any of the Cataloging Options settings. This means you can't add Keywords (other than path/filename), Descriptions and other field data, copy/move images or rename files as part of FS. Autosync settings... (Windows = AutoSync Settings). When not available, in the Mac client the icon is dimmed; in Windows, it is completely hidden and removed from the context menu. This allows the settings to be altered for server based AutoSync catalogues. The settings dialog is shown further below. AutoSync is new to v7 and is a Portfolio Server based feature so is only available in served catalogues (both FDB and SQL). Reveal in Finder (Windows = Explore). Opens the folder in a new Finder/Explorer window. Continuously (Updates folder status). Automatic mode. Periodicity is set in the next pane below. 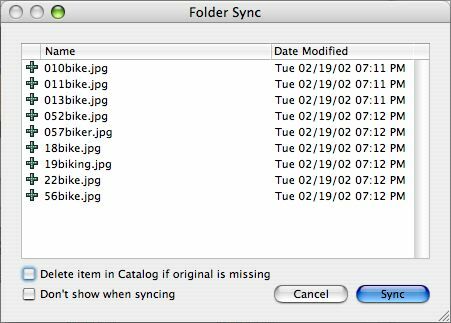 When Syncing (Updates folder status on Sync). Effectively a manual sync. When changes are found by the server. Only when the user clicks the Sync button. On a timed schedule, every: [select] 1 minute, 5 minutes, 30 minutes, 1 hour, 4 hours, 1 day. Each sync, once started runs until complete. Next timer starts on completion of the last sync. For exact timing use the version below. Periodic and timed AutoSync can't be used together. On a specific hour of the day: [select] 00:00, 01:00, ...etc....23:00. You may not set 'user' times - e.g. 23:15 - only list items are. Each sync, once started runs until complete. Periodic and timed AutoSync can't be used together. Leave the Item in the Catalog. Same effect as the option on the FS dialog above. Delete the Item from the Catalog. Same effect as the option on the FS dialog above.